The Arginase Gold™ assay technology is based on the detection of Arginase-1 activity with the proprietary probe Arginase Gold™. The probe gives a fluorescent signal in the presence of arginine and is quenched in the presence of ornithine (Figure 1). Arginase Gold™ is a homogenous mix-and-measure (‘addition only’) assay. Arginine is detected by a single incubation step at room temperature. The assay makes use of a fluorescence readout and is robust (Z’-factor > 0.6). Progression of the assay can be followed in real time, allowing for kinetic experiments. Arginase Gold™ was especially developed for use in multi-well plates and for high-throughput screening. Figure 1. Schematic representation of Arginase Gold™ assay. Enzymatic conversion of L-arginine to L-ornithine is allowed to proceed for 60 minutes, after which the progress of the reaction can be measured immediately with fluorescence detection at 510 nm. Arginase-1 is an enzyme that converts L-arginine into L-ornithine. Arginase-1 is an important drug target for cancer immunotherapy. Full-length Arginase-1 was recombinantly expressed and purified from E. coli. Purified Arginase-1 catalytically converts L-arginine into L-ornithine. • The signal of Arginase Gold™ is linearly proportional to the L-arginine and L-ornithine ratio at a concentration range up to 2.5 mM (Figure 2). • Arginase Gold™ is ideally suited for high-throughput screening of compound libraries. Figure 2. 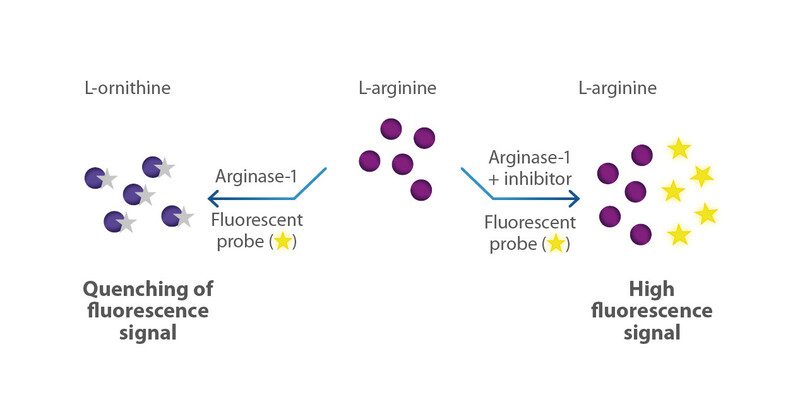 Arginase Gold™ calibration curve with concentrations of L-arginine and L-ornithine in the assay. B. Dose response curve of the Arginase-1 reference inhibitor ABH generated with the assay. • Enzymatic activity is measured in a homogenous assay format. Only two addition steps are required before readout. • Short incubation times at room temperature and mild reaction conditions allow operation on high-throughput robotic systems in 384-wells plates. • Robust assay suitable for high-throughput screening. • Inhibition of Arginase-1 results in gain of signal. • Kinetic experiments and end-point measurements can be performed with the same kit. • Fluorescent read-out is less prone to interference, in contrast to the standard colorimetric urea assay. • The assay can be performed in a short time, it only takes 1.5 hours from the start of the reaction to fluorescence detection. The Arginase Gold™ kit can be ordered directly from NTRC as a 1,000 data points ready to use kit. The product number is NTRC-hARG-1K. The kit includes Arginase-1 enzyme, substrate, detection reagent and reference inhibitor. Please contact us for custom-based large quantities or to order components separately.